Rabbi Levi Langer attended Yeshivas Ner Israel in Baltimore, MD and Beth Medrash Govoha in Lakewood, NJ. While in BMG, he delivered in-depth Daf Yomi shiurim to a group of married students which mirrored the current Shas Illuminated shiur format. He also served a Rosh Chabura for both Limud Gemara of several Masechtos as well as of the Nach B’Iyun Chabura, completing several seforim of Nach in their entirety. 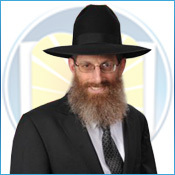 Since 2002, Rabbi Langer has been Rosh Kollel of the Pittsburgh Community Kollel where he has been teaching a wide variety of Torah topics including contemporary Medical Halacha, Nach, Gemara B’Iyun and other subjects. Shas Illuminated is privileged to have Rabbi Langer serve as a Maggid Shiur.